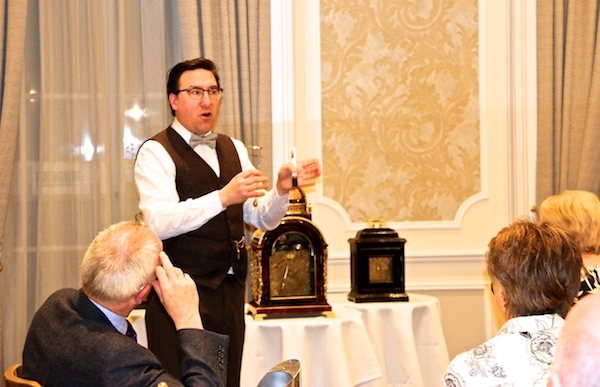 Local horologist Adrian Overton, of Overton Clocks in Chesterfield, paid a second visit to the Club to talk about some unique clocks from his own collection. Adrian is a master craftsman and a Freeman of the Worshipful Company of Clockmakers, no less. He has earned a strong reputation, and his customers come from all over the world. He has a strong following with collectors of special timepieces, and in the last four years has built a good reputation with customers in and around Chesterfield who simply need a reliable clock repair service. His enthusiasm and love of his subject was clear as he showed us 4 clocks of special interest. The clocks were all from his own collection and were a late 18th century 8-day Alarum (an early travelling alarm clock), a unique c1760 experimental Duplex regulator, a Raingo Freres gilt striking clock with ceramic flowers (thought to have been made in France for the Empress Eugenie), and a beautiful, large and very heavy mahogany mantel clock made by Thwaites & Reed, possibly in 1851 for the Great Exhibition.